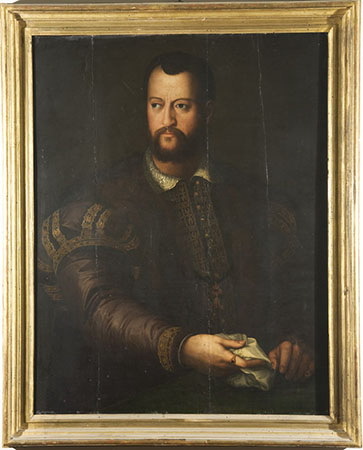 Cosimo I de’ Medici, Grand Duke of Tuscany (1519 -1574) was the nephew of Ottaviano de’ Medici. 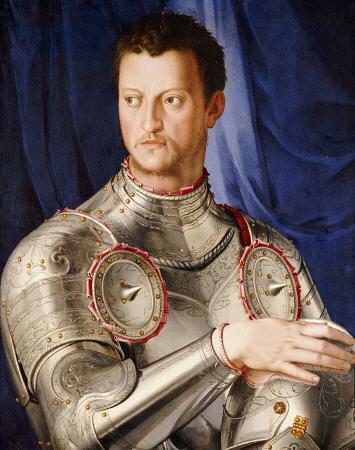 His mother, Maria Salviati, was a granddaughter of Lorenzo the Magnificent; his father, the professional soldier Giovanni delle Bande Nere (1498–1526), was killed when Cosimo was seven. When, in 1537, Lorenzino de’ Medici murdered Alessandro de’ Medici, the tyrannical Duke of Florence, Cosimo was the only available successor. 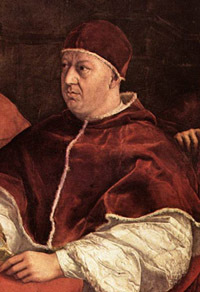 Initially his power was limited, but he became Duke of Florence in 1537, after his victory at the Battle of Montemurlo, and Grand Duke of Tuscany in 1569. Cosimo, more powerful than any earlier Medici, strove to create a court whose splendor should rival the proudest European courts and to express the triumphs and ambitions of his dynasty through the architectural magnificence of his palazzi and public works. He cultivated the myth of the great tradition of Medici art patronage, restoring the plundered Palazzo Medici, and reassembling and enriching the Biblioteca Laurenziana, founded by Cosimo il vecchio. He commissioned from Giorgio Vasari a portrait of Lorenzo the Magnificent, as an act of homage to his ancestors, and the desire for a noble lineage led to his claiming descent from the first Etruscan settlers in Tuscany and the title Ducatus Etruriae. Cosimo supported archaeological excavations at Etruscan sites, where the Chimaera of Arezzo was found in 1553 and the Arringatore in 1566. Humanists and poets, such as Vincenzo Borghini, and artists, such as Agnolo Bronzino, Benvenuto Cellini, Pierino da Vinci and Giorgio Vasari, gathered around him and enhanced his glory and power. In 1554 he established the Arazzeria Medicea, and he was joint head, with Michelangelo, of the Accademia del Disegno (founded in 1563). Florence again became an important centre for gems and medals. Agnolo Bronzino was court artist from 1539, and his many state portraits of Cosimo and his family are propagandistic images of power and authority. In 1545 a bust of Cosimo I was commissioned from Benvenuto Cellini, but this dramatic work was replaced by a more conservative image by Baccio Bandinelli. The first Medici residence to receive embellishment was the Villa di Castello, where in 1538 Cosimo commissioned Niccolò Tribolo to realize a grandiose garden, adorned with allegorical sculptures glorifying the Medici, that contrasted with the relative modesty of earlier Medici villa gardens. In 1540 the Duke moved from the Palazzo Medici to the Palazzo della Signoria (which from this time began to be known as the Palazzo Vecchio) and began extending the latter, having the Salone del Cinquecento (photo bellow) remodelled by Bandinelli. The Sala dell’Udienza was frescoed by Francesco Salviati (photo bellow). In 1549 he moved to the former Palazzo Pitti on the other side of the River Arno, which had been bought by his wife, Eleonora of Toledo. Cosimo had this new family palace enlarged and altered by Bartolomeo Ammanati from 1560 to 1568 (although according to Vasari it was Eleonora who made the arrangements for this). Especially noteworthy is the Mannerist treatment of the courtyard, which opens on to the Boboli Gardens, laid out by Tribolo in 1549–1550. The Palazzo Vecchio was now used exclusively for government business. In 1554 Giorgio Vasari replaced Bronzino as the favoured court artist, and he became artistic superintendent of an ambitious project to transform its interior. A series of rooms, with frescoes designed by Vasari, was dedicated to the glorification of the Medici. The sequence opened with a room extolling Cosimo il vecchio and culminated in the Sala dei Cinquecento (photo bellow), where the ceiling decoration, whose program was devised by Borghini, glorifies Cosimo’s rule; Cosimo is shown dominating the artists of his court. In several rooms frescoed decorations were accompanied by sets of tapestries, most of which were designed for the Arazzeria Medicea by Joannes Stradanus. Cosimo also kept his magnificent collection of bronzes, marble statuettes, curios, medals and miniatures in a small room in the palace, called the Scrittoio di Calliope, which was the first Medici museum of this kind. 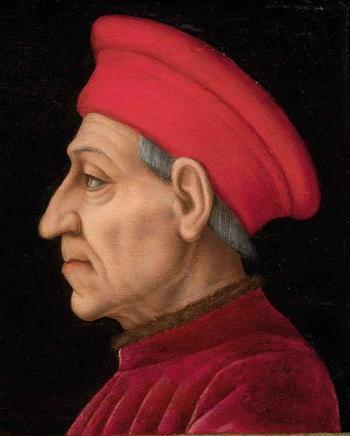 Ancient works were added to Lorenzo the Magnificent’s 15th-century collection of small bronzes and medals, and Cosimo searched for rare Roman, Greek and Egyptian works. In 1562 a show-case of medals was presented to him by Conte Orsini di Pitigliano. Cosimo also had medals made with his own image, a series by Domenico Poggini from and one by Pietro Paolo Galeotti from around 1569. Cosimo was also concerned that Florence itself should reflect the triumph of his dynasty, and he enriched the city with buildings and with sculpture. The building of the Uffizi, begun in 1559 by Vasari’s, expressed order and harmony. It was an administrative structure, in the ground-floor of which Cosimo housed the offices of the Florentine state; on the first floor he accommodated the art treasures assembled by the Medici, laying the foundation of one of the most important art collections in Italy. 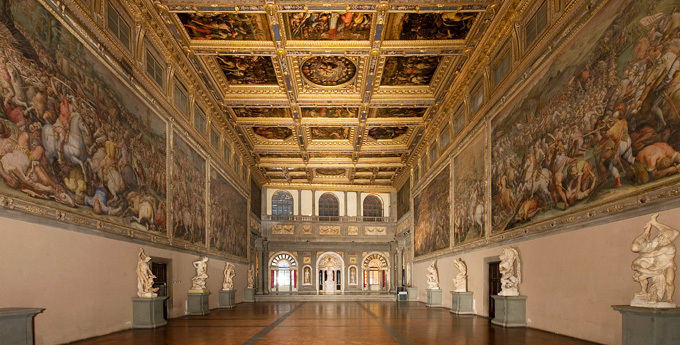 In 1564, to secure a safe passage from the palace of government to his private palace at all times, the Duke commissioned Vasari to construct a long corridor, running from the Palazzo Vecchio, through the Uffizi, to the Ponte Vecchio and thence to the Palazzo Pitti. 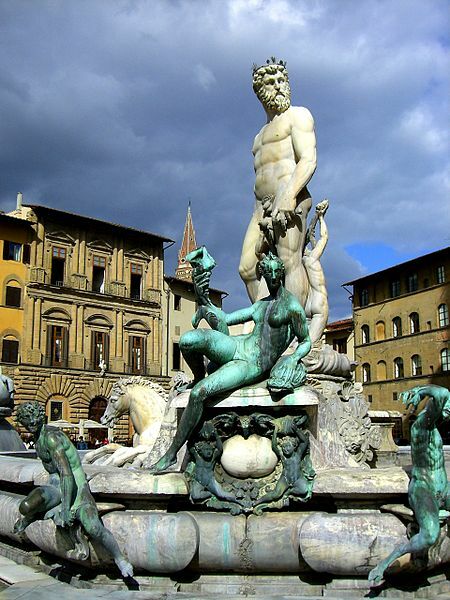 Cellini’s bronze Perseus with the Head of Medusa, perhaps symbolizing Cosimo’s leadership, and Ammanati’s Fountain of Neptune were commissioned for the Piazza della Signoria; columns commemorating the Medici were erected in the piazzas of San Marco, Santa Trìnita and Santa Felice. 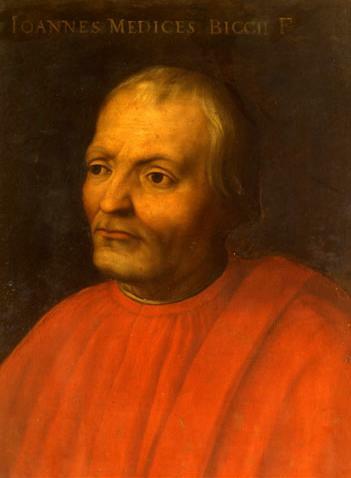 Cosimo had a special relationship with Pisa, reinforcing its naval power and founding the Order of the Knights of San Stefano in 1526; he also supported the reopening of the University of Pisa. In place of the earlier republican city centre, he commissioned Vasari to build the church of San Stefano and the Palazzo dei Cavalieri. 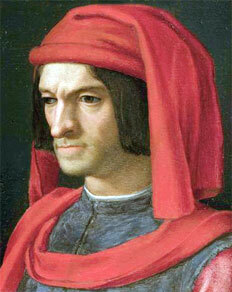 His interest is commemorated in Pierino da Vinci’s marble relief Pisa Restored. 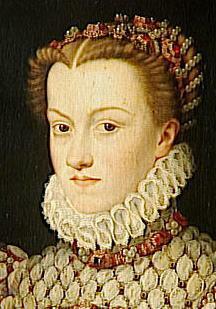 In 1564 Cosimo, in poor health, decided to withdraw from political life in favour of his so Francesco I de’ Medici.